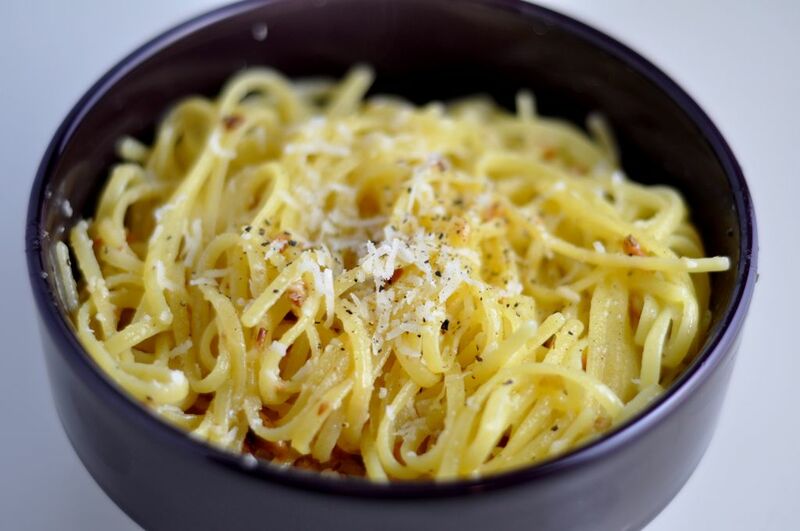 One of my favorite pasta dishes is spaghetti limone and one of my favorite places to order it is Lil’ Frankies. Being a lemon and cheese addict, this dish hits the spot every time. Yesterday was a cold, rainy Sunday and I was craving a warm, satisfying meal but as usual I wanted to make something healthy. Bring pot of water to boil and cook quinoa pasta according to directions on the back (about 6-7 minutes). While pasta is cooking, place pine nuts on small pan on medium heat and let toast for about 15 minutes or until lightly browned (tossing occasionally so both sides get toasted). Let cool and finely crush pine nuts (I like to place them in a plastic bag and smash them with a can). In a separate small pan, coat pan with olive oil and add garlic and let cook on medium heat for a few minutes. Strain water from pasta, place pasta back in pot and mix in all ingredients. Top with a little extra parmesan and serve. This entry was posted in Recipes and tagged extra virgin olive oil, garlic, lemon, Lemon Zest, linguine, Parmesan, photoblog, pine nuts. ← Make Your Own Pizza Night! I happen to have all the ingredients in the house and can’t wait to try it tonight! Sometimes the simplest recipes are the best! I love it, thanks for sharing! Sometimes the simplest recipes are the best! I too have all these ingredients on hand. I love it, thanks for sharing! Thanks for stopping by sprout & pea! I have not tried quinoa pasta before, seems very healthy, garlic, lemon what more to ask for. I definitely recommend quinoa pasta – same texture as regular pasta, but much better for you!